Tell HEB How You Feel About GMOs Today! HEB welcomes input from consumers. If they hear from even a small number of people on an issue, they will take notice. HEB needs to hear that consumers are concerned about the unlabeled, untested genetically engineered ingredients that are in about 70% of processed foods on their shelves. Consumer feedback is the first step to opening a dialogue on how they might become more involved in protecting consumer choice in the marketplace. Let's encourage HEB to support the consumer's right to food free of genetically engineered ingredients! In Europe, many major corporations and food chains have gone GE-free* because of consumer pressure. That could happen here right in central Texas if we all do our part. Don't underestimate our power. We can make a difference! It's time to let HEB know how you feel about genetically engineered foods and your rights as an HEB shopper. *GE-free in many other countries: Safeway, General Mills, Heinz, Hershey's, Kellogg's, Kraft, Proctor & Gamble, Coca-Cola, Nabisco, Nestle, PepsiCo, Pillsbury, Burger King, Quaker Oats, McDonald's. Latest News: Two years after our last meeting, HEB has announced new Central Market Organic and Central Market All Natural product lines. 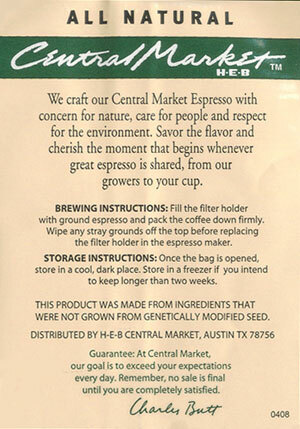 While other companies manufacture products that are GMO-avoidant, HEB is the first to actually label that "THIS PRODUCT WAS MADE FROM INGREDIENTS THAT WERE NOT GROWN FROM GENETICALLY MODIFIED SEED". This is a significant victory for the consumer's right-to-know. However, the Central Market label caters to elite shoppers who have the awareness to make conscious choices about the food they buy. What about the majority of HEB shoppers who haven't a clue? Why should they be consigned to eating GMO laden products? HEB should expand their GMO-avoidant policy to ALL their product lines. It's the right thing to do. Second Meeting: On April 25, 2003, there was a second meeting with four HEB representatives for over two hours. HEB has agreed to continue the dialogue in the near future. HEB No GMO's Please! : A growing coalition of organizations and consumer advocates made repeated requests for a follow-up meeting with HEB. HEB was unresponsive to the requests. A Thanksgiving themed Rally and Press Conference was held November 25, 2002 at HEB Corporate Headquarters as an alternative method of communication. The Beginning: At the end of April, 2001 Texas consumers concerned about GMO contamination and the consumer's right-to-choose, launched a letter write-in campaign to HEB, our Texas grocery chain. HEB is family-owned Texas business with more than 300 stores and 56,000 employees in Texas and Mexico. As HEB has a reputation for listening to customer feedback, we were hopeful that HEB would respond positively to our concerns. Within a few weeks, HEB offered to meet with us. On June 13, three HEB representatives, including the Vice President of Quality Assurance and Environmental Affairs, the Director of Customer Relations and the Central Texas Regional Public Affairs Manager, met with seven concerned Central Texas consumers for over two hours. This is a first step toward finding solutions to the current lack of consumer choice in the marketplace. But HEB will only make the necessary changes if a significant number of Texas consumers express their concerns. We're hoping that you will join our efforts to make consumer choice a reality in Texas. Available in stores. Just ask for one at the service desk. I am concerned that genetically engineered food products are being sold in your stores. If I had a choice, I would avoid eating them and feeding them to my family. Unfortunately these foods are not required to be labeled, so I have no way to avoid them. I believe genetically engineered crops which are altered with viral, bacterial and antibiotic resistant genes pose significant human health and environmental risks. These foods, which have not been adequately tested, are increasingly difficult to avoid because of genetic contamination through cross-pollination or improper handling. Even organics are being contaminated. Now that food crops are being used to produce pharmaceuticals and industrial chemicals, the risk is even greater. The genetic integrity of the food supply and the consumers' right-to-choose must be protected. Supermarkets like Whole Foods, Wild Oats, and most recently Trader Joe's, have already eliminated GE ingredients from their store brand products. If these national chains can do it, so can HEB. Your new Central Market Organic and Central Market All Natural brands are a step in the right direction. You are to be especially commended for labeling the All Natural brand with the information that the "product was made from ingredients that were not grown from genetically modified seed". This proves your vision and leadership in the industry. However, the Central Market label caters to elite shoppers who have the awareness to make conscious choices about the foods they buy. What about the majority of HEB shoppers who don't know about GMOs? If you expand your GMO-avoidant policy to ALL your product lines, ALL your customers will be protected from this questionable technology. It's the right thing to do. I am counting on HEB to commit to using non-GMO ingredients in ALL your brand name products including HEB and Hill Country Fare labels, to labeling these products with regard to GMO content and to fighting for the genetic integrity of our food. HEB continues to hide behind the FDA's sham assessment that GMOs are safe and deflect customer concern to other food safety issues. They also refuse to acknowledge that as genetic pollution increases, organics will also become contaminated. Availability of organic produce in many of their stores is woefully inadequate and little organic processed food appears on HEB shelves. HEB consumers basically have no choice but to buy the unlabeled, GMO contaminated food that fills their stores. HEB has made several revisions to their consumer response letter since early May 2001. Please let SAY NO TO GMOS! know if you have received a version different from those posted below. Hello, and thank you for contacting us at our H-E-B Web Site. We always appreciate hearing from our Friends and Customers. Thank you for your letter expressing concern about genetically engineered food products. Our first commitment is to the safety of our Customers. The FDA has determined that genetically modified foods are safe and do not require special labeling unless they have a significantly different nutritional composition. However, we are continuing to study all aspects of the genetic modification issue and are actively seeking input from a wide range of customers and scientists. The large variety of organic products we carry are to help meet your desire to purchase GE-free products. We typically stock from 40-65 organic items in our Produce Departments and currently carry 39 organic products in our Grocery Departments. Recently published USDA regulations prohibit organic products to be produced using recombinant DNA technology. We also carry natural beef and hormone-free poultry. The Nature's Harvest Departments located in some of our larger stores provide an even wider variety of organic items. Although we would like to make complete product offerings available in all stores, the limited space in some stores makes this impossible. We have a Quality Assurance Lab dedicated to conducting regular food safety screenings of the products we offer for sale to assure we have the highest quality food available to our Customers. In addition, we have a staff of food safety experts who routinely inspect all of our stores to insure they are complying with all of H-E-B's rigorous food safety requirements. Thanks again for sharing your thoughts on this issue. We look forward to each future opportunity to serve you. H-E-B is proud to serve you as our Customer and we will look forward to all future opportunities we may have to serve you. We genuinely value your comments and your business. As we strive to deliver superior Customer Service, we encourage you to continue letting us know how we can serve you better. 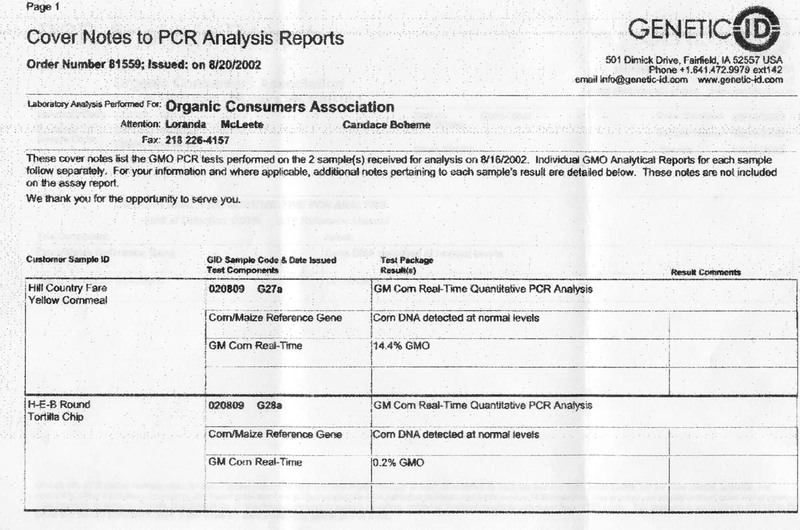 Thank you for your letter expressing concern about genetically engineered food products. This is a very complicated issue and we hear strong opinions expressed by both sides. We are continuing to study all aspects of the recombinant DNA issue and are actively seeking input from a wide range of Customers. The large variety of organic products we carry may help meet your desire to purchase GE-free products. We typically stock from 40-65 organic items in our Produce Departments and currently carry 39 organic products in our Grocery Departments. We also carry organic beef and hormone-free poultry. Although we would like to make complete product offerings available in all stores, the limited space in some stores makes this impossible. The Nature's Harvest Departments located in some of our larger stores provide an even wider variety of organic items. As you know, according to the new USDA guidelines, organic products cannot be produced using recombinant DNA technology. Thanks again for sharing your thoughts on this very difficult issue. We look forward to each future opportunity to serve you. Thank you for your recent correspondence expressing concerns about genetic engineering. This is a complicated and controversial issue. Our customers have a wide range of opinions about genetic engineering, both pro and con. Your input is valuable in helping us understand more about the way this issue affects the people who shop in our stores. H-E-B is dedicated to providing our customers with a safe food supply and we work hard on those things within our control that affects food safety. For example, we have extensive quality and safety testing programs for produce and meat. Food safety in our stores is supported by a team of Sanitarians who conduct training for our store Partners and rigorous routine inspections. However, in some areas of food safety we must rely on the judgement of government agencies that have been given the responsibility to insure the safety of the US food supply. For example, the FDA is responsible for insuring the quality of the packaged food we sell from national brand manufacturers. You expressed a desire to be able to purchase food that has not been produced using genetic engineering. We support freedom of choice for our Customers. However, as you know, foods produced using genetic engineering are difficult for our Customers to identify because labeling is not legally required. FDA is the agency responsible for labeling regulations that cover much of the food we sell. They have ruled that foods produced using bioengineering, as a class, do not "differ from other foods in any meaningful or uniform way ". FDA's position is that they cannot, under current food laws, require bioengineered foods to be labeled as such unless the bioengineering has significantly changed the composition or nutritional content or has introduced an allergen. The FDA position makes it difficult for Customers like you who are trying to identify foods produced using bioengineering. There are some hopeful developments. FDA has recently proposed labeling guidelines to be used on food not produced with genetic engineering. Also, organic standards recently published by the USDA specifically forbid genetic engineering in products labeled as "organic". Nationally, sales of organic products have been increasing at about 20% annually. We continue to increase the number of organic products available in our stores. With the new USDA standards this means that more and more non-genetically engineered products are available. H-E-B has taken a cautious approach to genetic engineering where we have control. We have requested our milk supplier to not supply us with milk from any cows treated with rBGH. Also, the corn in the tortilla chips we manufacture is from a source-controlled/tested supply so we can protect our Customers from exposure to StarLink corn. For more information on FDA's labeling position we suggest you contact them at www.fda.gov. Thank you for sharing your concerns about genetically modified organisms in food products. Product labeling has emerged as the greatest debate in discussions about this technology. Many consumers are beginning to ask questions about whether the products they purchase contain ingredients that have been genetically engineered. Attached is some information addressing this issue I hope you will find helpful. The FDA in two circumstances requires special labels on biotechnology products: One is if the characteristics significantly differ from what is normally expected or, if safety issues arise. Milk, eggs, wheat, fish, crustacia, tree nuts and peanuts are all common allergens. If any possible allergens are inserted into a product that would not normally be an ingredient, the product must be labeled to inform sensitive consumers. Following is some helpful information provided by the Food Marketing Institute, of which H-E-B is a member and supporter. * The food industry supports the Government's process to assure that necessary steps are taken to ensure consumer protection, along with a safe and plentiful food supply. * The food industry supports voluntary labeling of foods produced without the use of biotechnology as a way to inform those consumers who prefer not to purchase such foods. * Food biotechnology employs the tools of modern genetics in the process of food production. For a more detailed explanation of the process, you may refer to FMI's biotechnology backgrounder available on the FMI Web site http://www.fmi.org/ or through FMI's Communications Department. * Foods developed through biotechnology face the same regulatory requirements the FDA uses to safeguard all foods. * Genetically modified food products will be regulated in the same way as foods produced by other methods. * Products will be judged on their individual safety and nutrition. * New ingredients added to food through biotechnology will be subject to FDA pre-market approval. * While FDA is the primary organization regulating bio-engineered food, the U.S. Department of Agriculture (USDA) and the Environmental Protection Agency (EPA) all play a role in regulating the research and development of food biotechnology products and its impact on the environment. Thank you again for writing, and for shopping at H-E-B. We value you as our Customer, and genuinely appreciate your comments and your business. We will look forward to all future opportunities we may have to serve you.